The Ministry of Culture, Sports & Tourism of Korea(MCST) and the Korea Arts Management Service(KAMS) engage in a broad range of international exchange programs designed to introduce Korean contemporary art to audiences worldwide. 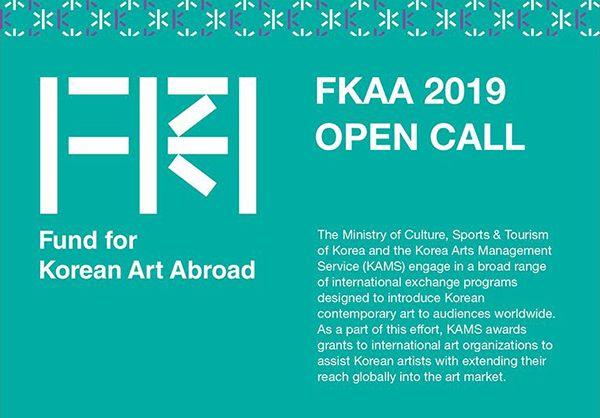 As a part of this effort, KAMS awards grants to international art organizations to assist Korean artists with extending their reach globally into the art market. International art organizations—both commercial and non-profit—that exhibit contemporary artworks by inviting Korean artists and/or collaborating with Korean partners. –your organization is represented by a Korean national. –your exhibition is operating as a bazaar or a fundraising event. –the Korean artist or Korean partner is responsible, in any form of payment, for the rent of the exhibition space or utility costs. –you are hosting an exhibition for which the Korean artist or Korean partner is already receiving funds from the Korean government, a Korean local government body, or a Korean public institution. Each exhibition can receive funds between 5-30 million KRW (approx. 4,400–26,500 USD). The grant money will be issued directly to the Grantee (international organization) following their submission of the Grant Receipt Form and documentary evidence of expenses incurred after the start of its exhibition. Airfares and accommodation expenses for the Korean artists, and artwork transportation costs. –Conclude an MOU with KAMS. –Conclude a Multi-Party Contract between KAMS and the Korean artist or Korean partner. –Include the name and logo of (1) the Ministry of Culture, Sports & Tourism of Korea (MCST), (2) the Korea Arts Management Service (KAMS), and (3) the grant program (FKAA) on all promotional, public relations, and relevant print materials. The application form must be completed in English and submitted to KAMS via email at: art.abroad@gokams.or.kr. (1) Application form: Download “Application form” on the KAMS website. (2) Agreement: Copies of official agreements, contracts, invitation letters, etc. (3) Other materials (optional): Materials considered useful for the screening process include, but are not limited to, the following: press releases, articles, portfolios, etc. (1) Review of application forms accepted. (2) Korean artist(s) and/or partner(s) who pass the review process should give a presentation of the exhibition and will be interviewed by a panel of judges. The results of each screening process will be announced on the KAMS website. Grantees will also be informed individually. –False statements are found to have been made on application materials. –The project proposed for the grant is not executed. –Any participant in the grant, including the international organization, Korean artist or partner, fails to abide by the grant’s requirements. –Changes are made to major parts of the exhibition without informing KAMS in advance. –The international organization fails to submit the Grant Receipt Form and documentary evidence within the required period, or if the documentary evidence submitted is considered invalid.